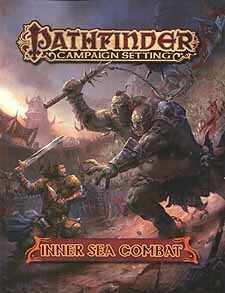 From the brink of the Worldwound, where demonic hordes lay siege to the mortal realm, to the battlefields of Mendev and Nirmathas, where soldiers distinguish themselves as heroes of ideals, battle is a common part of life in the Inner Sea region. Whether practised by virtuous crusaders, fierce gladiators, or daring scoundrels, skill with a blade and knowledge of when to use it can mean the difference between life and death. The secrets of battle might not be etched on altars or scribed in spellbooks, but they're just as diverse and powerful as any magic - and just as available for bold heroes to claim. A who's who of the Inner Sea Region's deadliest martial masters. Details on four types of martial training grounds - dojos, gladiatorial arenas, thieves' guilds, and war colleges - along with rules for joining and honing one's skills within such organizations. Rules for several types of specialized or variant combat, including the secrets of the legendary Aldori swordlords, fighting styles particular to Golarion's many faiths, gladiatorial combat, mastering monstrous mounts, and using technology in combat. Two new cavalier orders - the order of the beast and the order of the Guard - along with new context for each knightly order. Two new prestige classes - the Pure Legion enforcer and the Ulfen Guard.